For years, the Cayucos Fire Protection District has been faced with funding and staffing issues. Cayucos firefighters receive some compensation but are considered volunteers by state standards. The agency also has a contract with Cal Fire, which in recent years, was eating up an increasing amount of the fire department’s budget. In June 2016, Cayucos voters rejected a tax measure to fund a full-time fire department. The ballot measure was widely seen as a last-chance opportunity to save the agency. Last September, the Cayucos Fire Protection District filed an application for dissolution with the San Luis Obispo County Local Agency Formation Commission (LAFCO). LAFCO has yet to accept the application. On Tuesday, the board of supervisors guaranteed it would provide fire protection services to Cayucos if the existing district dissolves. 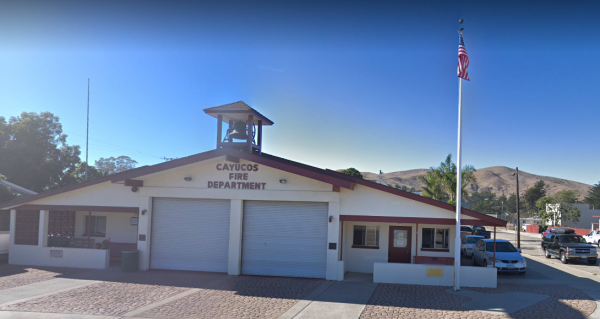 “No matter what happens to the Cayucos fire Protection District, the community of Cayucos will have fire protection services,” County Administrative Office Division Manager Trevor Keith said in a statement. The board settled on the most expensive of funding options it was presented with — a $912,162 annual expense that would fund a year-round, fully-staffed structure fire engine at Station 56 located on Cayucos Drive. The money would come out of SLO County’s general fund. In addition to basic fire protection, the services Cayucos would receive include fire investigations, business safety inspections, fire hydrant maintenance, community CPR classes, medical stand-by for special events and school fire prevention programs. Additional costs are also expected over time as fire station and equipment maintenance needs arise. Initially on Tuesday, Supervisor Adam Hill, who returned from a self-imposed leave from board meetings, expressed concern with spending so much money on Cayucos firefighting services. Hill did not maintain his objection, however, over the course of the hearing. During much of the board discussion, the supervisors focused on fire protection services countywide, rather than just in Cayucos. Like the Cayucos district, the Five Cities Fire Authority in South County is also experiencing financial troubles, and there is some concern the county will have to take it over, as well. Supervisor John Peschong also said the community of Templeton wants a higher level of service than its fire department is currently providing. Meanwhile, Supervisor Debbie Arnold argued there should be equitable levels of fire protection services countywide. Ultimately, the board directed county staff to form a blue-ribbon committee to assess the future of firefighting needs countywide and report back within one year. “The board settled on the most expensive of funding options” of course they did, it’s the government way, where cutting, savings and living with in your means are foreign terms. Wait a minute! Cayucos DECIDES to get rid of their fire department, and the County generously gives them OUR money from the general fund? Meanwhile the County screws up a deal with a contractor, settles for 10 million and makes the people of Los Osos pay the whole damn thing? Something really stinks and it’s not the Los Osos sewer! That mistake was the fault of Honorable Bruce Gibson (yes, the taxpayers are still paying his mistress for working as his assistant) and Adam Hill. This new Board was not responsible for that BUT they are for this. The County needs to assess Cayucos landowners for this service same as the sewer in Los Osos including the upgrade for the Fire Station. Really, this is a waste of the general fund which affects all the County.